The Great Iron War has been raging for less than a year. The Earth is divided. War has changed. Humans fight in giant mechs - War Robots. A small strike force of American soldiers make their way into a Russian mining facility. Their mission? Capture the territory. Eliminate all opposition. Secure a foothold on enemy soil. Little do they know that their actions will shape the battle that follows for years to come. They are not ready for what happens next. The Great Iron War has just begun. A short story in four parts, a prequel to 'War Robots'. The Pitch. The only award that doesn't actually care about your book itself. You just got hooked by my pitch. It's not as cold as it sounds, we just had to hook your attention. An elevator pitch is exactly that- something that grabs the reader's attention in a short period of time. You also could call it a hook, or maybe a tagline. We're looking for the best pitches the world has ever seen. If you think you've got what it takes, give the information page a read. It won't take more than five minutes of your time, we swear. Tired of your usual boring cover? Why not shake it up a little? I'm making story covers for free! Yeah, absolutely free! You heard me right (well, read, but let's just keep this sales pitch rolling)! C: A few distinct things you want (or just tell me to surprise you, I'm pretty good at that). A few restrictions: I WILL do 18+ story covers, but maintain the right to refuse any story at any time, even if it is not 18+. One cover per story. No asking me to change again and again. I'll make small adjustments if really necessary, but that's it. Also, this isn't a rule, but if you're reading this far you must be really interested: perhaps give me credit somewhere? Like, in an awknowledgements tab? I won't put a watermark on the covers I make, so you're my only method of exposure. Like I said, this isn't a RULE, per say, but it'd be nice of you. Wow, you read all this? If you're really still reading this, add the word "Godspeed" onto your submission and I'll prioritize your cover! this is the story of cossie a cossack who jumps a lot leo who gets triggered easily lance who people calls chubs. Friendships will be made and broken,  loved ones  will be lost and darkness and corruption will consume the universe, unless Snow and her group of minor heroes can save the world!!! Stanllee and his sister Stacy fight to survive the bombing of their city. But the question lurks, why are they being bombed? Secrets lurk, and stanllee is determined to have them answered. On this journey they will learn what trust is, and how you know if you truly do trust someone. Most of all they will learn how to fight, and love, when times get hard. Our awards is back this year and better than ever! This awards is a place for you to get your story noticed. Your story will be judged against other authors in the same genre for a chance to win stickers and prizes. All participants will be given scores as well as short review! The Great Iron War still rages. Jackson Quinn has failed. The malignant TMC is hurting and they want to ensure that Quinn and his allies go down with it. Separated from their alliance, stranded far from home and on the run from the malevolent forces of corruption, Jackson Quinn and his allies will have to face a terrible truth. One last desperate shot is all they have to finish what they started. Their goal? End the Iron War, no matter the cost, no matter the winner. But will they be heroes for doing so, or will they become something much worse? 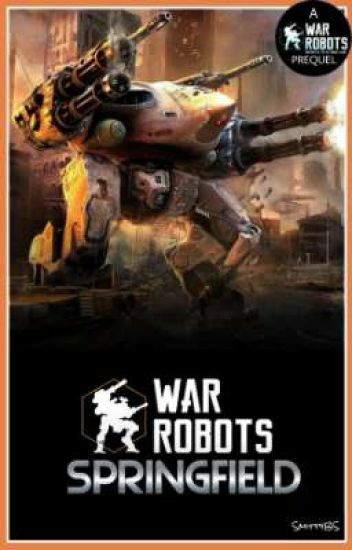 Choose your side, ready your weapons and enter battle in the explosive sequel based on the mobile game War Robots, a game with more story potential than any I've ever seen. No art is mine. Enjoy. Please note: I am (currently) unaffiliated with Pixonic or any company of any kind. All robots and locations were created by Pixonic, all characters are of my own creation. What happens now,that thorn and the gladers are free for the maze. But are they free? Find out in "the ember"